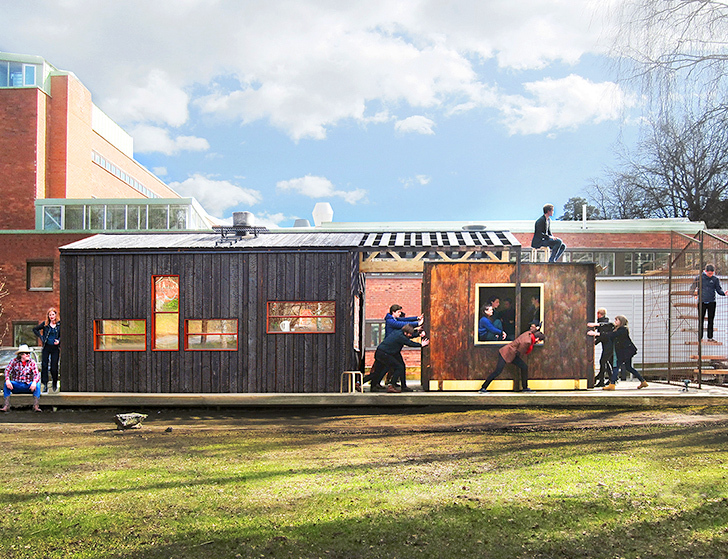 Students of a recently founded program at KTH School of Architecture in Stockholm designed and built their own rolling, low-cost, non-permit studio space and named it FRIGGATTO, after two Swedish non-permit building types. The building is comprised of two structures, the smaller of which acts as a "vehicle" that can be attached to the bigger one. Both were built by 24 students in two months, working on a budget of around 14,000 € ($15,700). Two non-permit building types were the inspiration for the new studio space. When moved, the “Frigg” is considered a vehicle by the officials and one has to move it at least once in six months if they want to avoid having to get a permit and paying municipal fees. Another requirement is that the structure isn’t physically connected to another house. This is why the students at KTH designed a 15-square-meter part that would sit next to the 25-square-meter part for six months before they disconnect and move it to connect it again. Between the two structures is a space that can be used as an outdoor workplace during nice weather. This part can be covered and features a staircase leading up to the roof, neatly positioned to bypass another bureaucratic requirement according to which structures that are up to 50 percent transparent aren’t considered buildings and therefore don’t need building permits. In order to be able to move the smaller structure, it has been built with a sandwich technique of fireproof pine plywood glued to each side of a Styrofoam insulation board. The outer layer was treated with tar and floor outfitted with fine tuned wheels that slide on a flat metal rail. The team worked for two full months and had to build with an extremely tight budget. 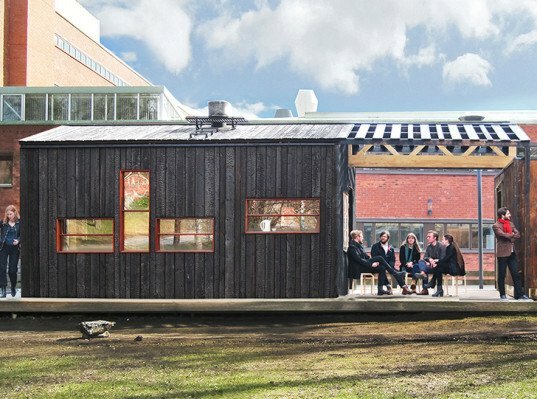 Students, teachers and carpenters collaborated on the project, one square meter of which is only 4 percent the price payed for a square meter of apartment space in the same area. The actual value of the house, as calculated by the team, is 76 000 €, including taxes, workers’ salaries, etc, which equates to about $85,000 USD. Two non-permit building types were the inspiration for the new studio space. This part can be covered and features a staircase leading up to the roof, neatly positioned to bypass another birocratic requirement according to which structures that are up to 50 percent transparent aren't considered buildings and therefore don't need building permits. When moved, the "Frigg" is considered a vehicle by the officials and one has to move it at least once in six months if they want to avoid having to get a permit and paying municipal fees. Another requirement is that the structure isn't physically connected to another house. This is why the students at KTH designed a 15-square-meter part that would sit next to the 25-square-meter part for six months before they disconnect and move it to connect it again. Between the two structures is a space that can be used as an outdoor workplace during nice weather. 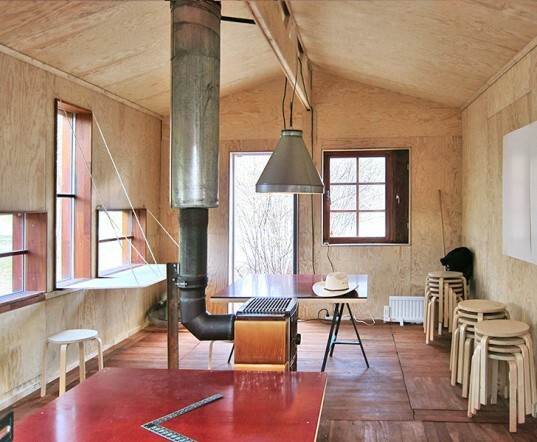 In order to be able to move the smaller structure, it has been built with a sandwich technique of fireproof pine plywoodglued to each side of a Styrofoam insulation board. The outer layer was treated with tar and floor outfitted with fine tuned wheels that slide on a flat metal rail.